St. Basil the Great was a Greek bishop and theologian who was noted for being an influential supporter of the Nicene Creed. Aside from his theological contributions, he was well known for his compassion for the poor and less fortunate members of his society. St. Basil the Great is the patron saint of hospital administrators, reformers, monks, education, exorcism and liturgists. We celebrate his feast day on January 2 and in time for it, let us look back to his life and remarkable contributions not just in religion but society at large. Basil was born to a wealthy family in Cappadocia in 329. Noted for their piety, his parents were Basil the Elder and Emmelia of Caesarea. Basil and his four siblings were raised by his maternal grandmother, Macrina, who was a follower of Gregory Thaumaturgus, a Christian bishop and saint who founded the church of Neocaesarea. Macrina’s husband was a Christian martyr who was sentenced to death before Emperor Constantine I’s conversion. 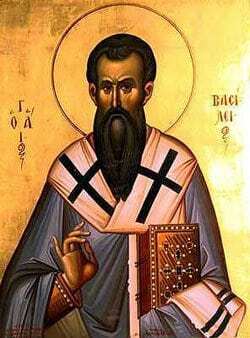 Basil was formally educated in Caesarea Mazaca in Cappadocia from 351-356. It was here that he met Gregory of Nazianzus, his lifelong friend who became the Archbishop of Constantinople. Basil and Gregory traveled to Constantinople to continue their studies and spent about six years in Athens. After leaving Athens in 357, Basil traveled across Egypt and Syria before returning to Caesarea to practice law and teach rhetoric for about one year. Basil’s life took a dramatic turn when he met the bishop and ascetic Eustathius of Sebaste. Basin left his profession in law and education to completely devote his life to God. After being baptized, he then traveled to Palestine, Egypt and Mesopotamia in order to learn more about asceticism and monasticism. He distributed his property to the less fortunate and briefly lived a solitary life near Neocaesarea of Pontus on the Iris. Although he respected the pious way of life of the ascetics, he realized that a life of solitude was not for him and he was more inclined to follow a communal religious life. In 358 Basil brought together a group of disciples that shared his views including his own brother, Peter. Together they established a monastic settlement on his family’s estate near Annesi. Soon his widowed mother, sister and other women joined the religious settlement and they committed themselves to a life of prayer and charity. It was during his time at the monastic settlement that Basil started writing about monastic communal life. His work was a significant influence in the monastic traditions of the Eastern Church. He also collaborated with Gregory Nazianzus on “Origen’s Philocalia,” a collection of the works of the Greek scholar, ascetic and theologian Origen. Basil later attended the Council of Constantinople. He first sided wtih Eustathius and the homoiousians, a semi-Arian group that taught that Jesus was of “like” substance of the Father, neither the same nor different from him. 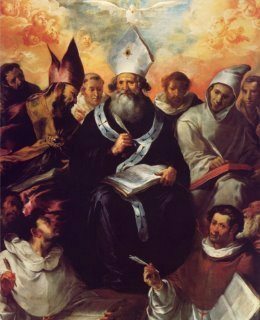 Later on, he left the homoiousian and became one of the most passionate supporters of the Nicene Creed. St. 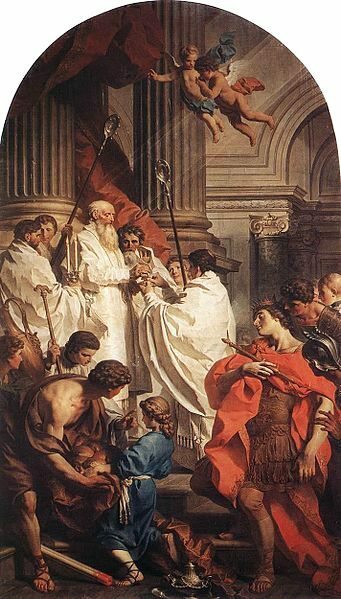 Basil the Great was ordained a deacon in 362 by Bishop Meletius of Antioch and later as presbyter of the church in 365. In the next years, Basil and Gregory Nazianzus devoted their life fighting off the Arian heresy which had grown so strong it was dividing the Christians of Cappadocia. The two friends participated in rhetorical debates with well known Arian theologians and speakers and emerged victorious. Their successes made it clear to Basil and Gregory that they had a future in church administration and Basil soon served as functional administrator in Caesarea. In 370, Basil was consecrated bishop of Caesarea, a position which allowed him to demonstrate his leadership, generosity and sympathy. Among his charitable activities include organizing a soup kitchen, distributing food to the less fortunate during a time of famine and donating his personal inheritance to the poor of his diocese. He also actively worked to help thieves and prostitutes turn away from their life of sin. Basil was brave enough to speak against public officials who were corrupt and preached every morning and evening in his own church. He also warned his clergy against the temptation of wealth and the relatively easy life in priesthood. He was very meticulous in choosing candidates for holy orders. One of Basil’s most notable accomplishments was the Basiliad, a huge complex outside Caesarea, which housed a hospice, hospital and a poorhouse. The Eastern Roman Emperor Valens himself donated some land for the building of this structure. St. Basil the Great suffered from liver disease which had been aggravated by his excessive ascetic practices. The exact date of his death is unknown. St. Basil’s legacy lives on the form of his many contributions in the world particularly in the realms of theology, monasticism and liturgy. St. Basil is one of the most important figures that shaped Christian monasticism. In fact he is often called the “Father of Eastern Monasticism” and many religious orders in Easter Christianity are named after him such as The Congregation of St. Basil. St. Basil helped promote the moderation of austere practices which had previously defined monastic life. He is also credited for helping promote the balance between work and prayer. 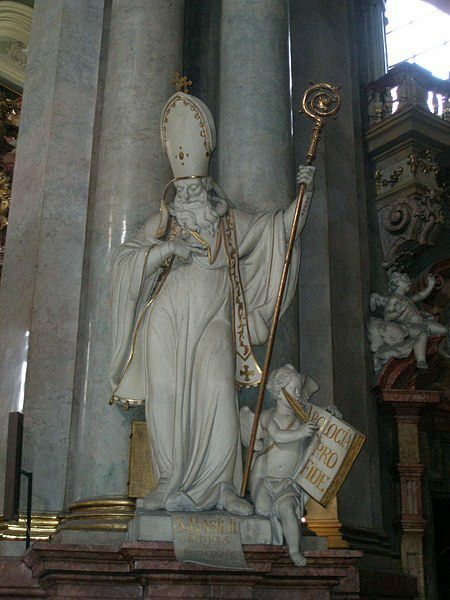 Saint Basil the Great is considered very influential in the history of Christian liturgy. Although it is not clear which parts of the Divine Liturgies credited to him are actually his work, it is accepted that a vast corpus of prayers that he created has survived in different churches in Eastern Christianity.